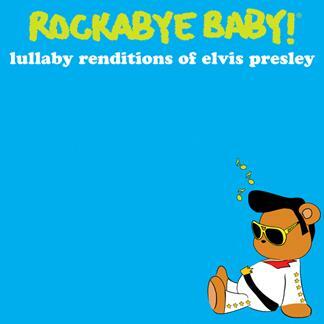 As an Elvis fan, I just had to review this lullaby CD because I was fascinated to hear how the music of Elvis would be interpreted for lullaby music. After listening to this CD, I have to admit that I was impressed. Rockabye Baby! has an amazing selection of baby lullaby CD’s based on the songs of favorite rock bands such as Aerosmith, Black Sabbath, Journey and Kanye West. The latest CD, Renditions of Elvis Presley includes Jailhouse Rock, Heartbreak Hotel, Don’t Be Cruel and my personal favorite Love Me Tender among others. I have to admit that I am not familiar with all of the soothing instruments used to create the songs such as the mellotron, vibraphones and bells but it was definitely relaxing and pleasant on the ear. My children enjoyed listening to this CD during quiet time, while coloring and doing puzzles. It was refreshing for my husband and I to have an alternative to traditional children’s music. I am also going to keep these on hand for a unique baby shower gift. I always enjoyed the Beach Boys so I’ll choose that. Thanks for the wonderful giveaway. I am a Google Friend Connect follower. Thanks again. As a huge fan of Aerosmith, I would have to pick that CD. What a great idea! I’d pick the Lullaby Renditions of Coldplay. I follow Rockabye Baby on Twitter. I like Rockabye Baby on FB as Felicia King. I voted for you on On the Fence. I would love the Queens of the Stone Age version, thanks! I’d choose the Beatles for sure… already got our Beatles onesie to go with it 🙂 Thanks for the giveaway!